There are 24 Nucs in the above picture. Twenty of them will be overwintered with queens I produced here in my home yard. Nucs, or Nucleus Colonies, are small honey bee colonies created from larger colonies. The term refers both to the smaller size box and the colony of honeybees within it. The name is derived from the fact that a nuc hive is centered around a queen - the nucleus of the honey bee colony. A nucleus hive has all the same features of any full sized hive, with less width according to how many frames are used. 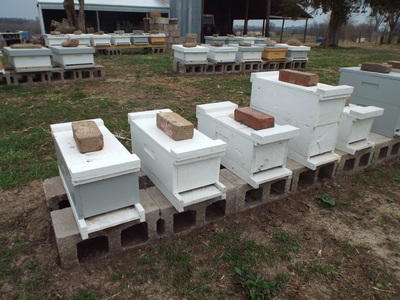 3 frame nuc's are often used as queen breeding nuc's. Enough nurse bees to hatch out the virgin queen and care for her while she goes out on her mating flights and begins to establish herself. The Breeder can check to insure she is laying a good pattern before selling her. 4 and 5 frame nucleus hives are usually sold as starter colonies. Purchasing a nuc may require a deposit for the box they are in. Take them home and transfer the five frames from the nuc into your eight or ten frame box. Put the new frames into the nuc and return it to the seller for a refund of the deposit. Alternately, purchasing a nuc may mean taking YOUR hive body, bottom board, inner cover and telescoping cover to the sellers location where he, or she, will transfer the frames for you, then you transport your hive home. If you buy nuc's, make sure that the frames used in those nuc's are the same frames used in your hive. Meaning; if you have deep, or 9 5/8 depth supers, make sure you are buying 9 5/8 depth nuc's. If your hives are mediums, make sure the nuc's you buy are 6 5/8 depth. If you are buying nucs, go through them with the seller. Make sure the comb the bees are on is DECENT.. meaning, he hasnt given you old black mouse chewed combs he wanted rid of.. If he has, walk away and do without bees from him. Make sure your new queen is LAYING in the nuc.. some nucs are overwintered, some are made up with queens from the south or California in the early spring. If your nuc has a queen in a queen cage, it is NOT A NUC yet, walk away! A nuc will have a laying queen, that is accepted by the bees in that nucleous hive. She will have brood, from capped brood to eggs that you can inspect. The REASON you pay the extra money for a nuc, is because the queen is established and laying, and because you get fully drawn frames with the bees. These frames will have eggs and brood, pollen and nectar. These are the things that set a nuc above and beyond a package of bees. Make SURE they are there. if they are not, then you are better off with a package. You could possibly buy TWO packages for the price of that one nuc. Most nuc producers adhere to a non legal guide, because they want to produce a quality product. They will make sure they are proud of what they are selling you. It is the ones that are there JUST to make money that you need to watch out for. Beyond purchasing them to start a hive, or using them to produce mated queens, nuc's have a more important purpose. Maintaining nuc's is what makes any apiary sustainable. With the inherent problems facing bees and beekeeping today, loss is inevitable. Disease, parasites, and winter losses WILL happen, no matter how hard you struggle. In order to replace those losses, you can catch swarms or do cut outs, you can buy packages, you can buy nuc's, you can split your surviving hives and forgo honey production for the year, OR, you can maintain a few nucleus colonies to use as replacements for the losses. "What? A nuc is just a transition, NOT something that is possible to maintain, you CANT maintain a nuc, it would just swarm, and eventually abscond!" If you don't like getting into the nucs to inspect, move brood, make new nucs etc, then they are probably correct! Nucs MUST be maintained, and its not all that difficult to do. I am in fact, enjoying my nucs as much, or MORE than I do my full size hives. If you have three or four hives.. you may, or may not wish to maintain a nuc or two. With few hives, purchasing a replacement package or nuc is not as overwhelming as it is to someone who needs to replace twenty colonies. The price of package bees is nearing $100.00, and a five frame Nuc can often hit $200.00. So consider your situation and decide if you don't mind paying, or if you don't mind splitting, OR if you think you should try keeping a few nuc's just in case. Images of nuc's prepared for early splits below. Three different styles. Standard 5 frame nuc's on the left. Double 5 frame nuc's (I prefer these!) in the middle, and the double 4 frame nucs on the end. The single nuc's offer a little more versatility and ease of handling. They can be slid together and wrapped in pairs for wintering. I have set aside all other nuc styles in favor of these. Not because the others did not work, but because of the versatility. I can move a single nuc anywhere I want at any time. Swapping it into a hive or adding another standard nuc box etc.. Wrapped together for winter they work quite well. The standard 5 frame double nuc is just a bottom board built to accommodate two standard 5 frame nuc boxes. They seem to work well for wintering, and are well adapted to "keeping" nuc's to use as brood factories, Comb building factories and keeping that spare queen. They work as well as the standard nucs pushed together, but lack the versatility in that I must leave the bottom board exposed, or place an empty box on it when I move ONE side of these nucs into a hive, or use them to re queen etc.. 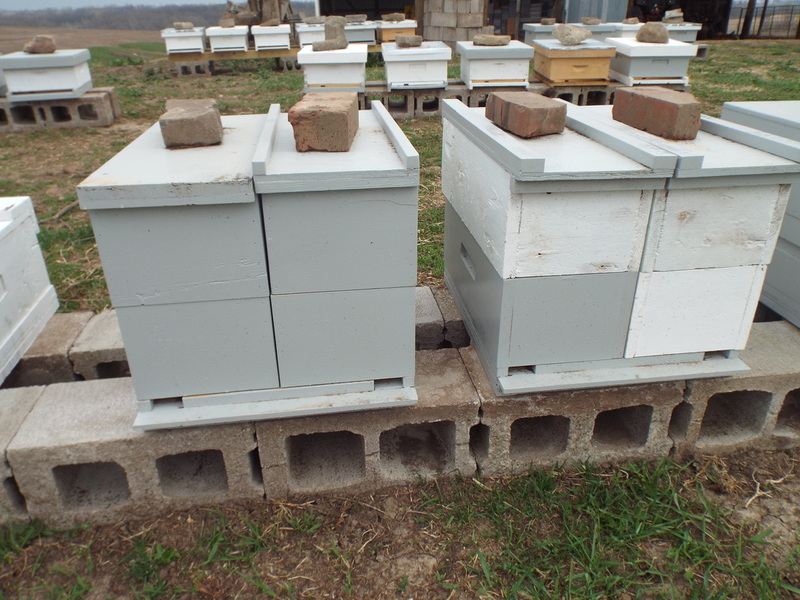 The 4 frame double nuc shown in the right picture has an entrance on opposite corners and uses a single standard hive body as the lower chamber with seperate 4 frame boxes added above. One advantage is that these fit perfectly on TOP of a standard production hive. It works VERY nicely but lacks the versatility of the separate boxes. Really good for wintering and uses standard tele cover but requires a modified bottom board and separate inner covers for each side. At the point of creating these differences, I prefer the standard nucs in the left picture. At any time I can pull One SIDE of this nuc and put it anywhere I need it, to combine it etc, etc.. The bees in these boxes still cluster in the center of the two hives during the winter. The Nuc style tops are removed, reversable inner covers are added with 2" foam on top of them, and the entire double nuc is wrapped. Making up a nuc is as simple as selecting the frames to put in it with the bees on those frames. Either transferring the old queen or giving them a bit of time to know they are queenless and adding a caged queen. There is NOTHING hard about making up a nuc. I have listened to others explain making up a nuc, and often thought to myself.. why does this sound so complicated? In listening, or reading, there SEEMS to be a LOT of information, so as you read below, remember what is typed above. There are details that will make a difference in how well that nuc gets going quickly, but it ALL relates back to what I typed above. Find a strong hive, pull 4 frames of mixed brood, pollen and honey along the top edge, as well as the adhering bees, add a drawn frame and put them in the nuc box. Move them to another yard, or partially block the entrance, wait 1 to 10 hours, install queen cell or queen cage. Feed them. Come back in a week and check for eggs. Yep, really! That is all there is to it. The BEES will take care of the rest. You provide what they need, they WILL do the rest. Understand, that if you are going to make up a nuc and have them raise their own queen, that you need to use un capped brood to get nurse bees. Shaking off two extra frames of Nurse bees would not be too much. It will take 15 days for the queen to emerge. A few days to mate, and another 21 days for her first brood to emerge.. So you will have about 40 days from the time you make up the nuc to the first new bees emerging. You want YOUNG bees in this nuc. capped brood MAY have a few nurse bees, but most will be house bees maintaining the heat, as capped brood is no longer fed. Using uncapped brood will insure there are nurse bees, and it will also prolong the time this hive has young bees. When the new queen starts laying, those eggs will turn into larvae that need fed. Details of making a nuc. At this point, your hives should be doing all they can to expand and grow. Pollen and nectar are coming in from natural sources, and you may yet be feeding just to make sure those hives have all the resources they need to grow. You should have ordered your queens for this time period, expecting to do these splits/nucs. Opening a colony should find eight or MORE frames of brood in different states of development. Ideally you want 12ish frames with brood. Crowded, but not YET to the point they have started changing those ever present queen cups into queen cells. Usually, as you look at the frames, you will find that the brood is surrounded on the top by a ring of pollen, nectar, and possibly even some capped honey in the corners. This is exactly what you want. Find the frames with the capped brood or very soon to be capped frames, and use at least one of these so that this hive/nuc will very soon have new bees emerging. The rest of the frames need to be open brood so that those frames will have young nurse bees on them. These frames can be taken, with adhering bees from one hive, or two or three hives. As I select these frames, I don’t shake any bees off, I lift, I look, I decide. If I like the frame, meaning it has good brood, some pollen and nectar/honey I will give this frame a LIGHT mist of 1/1 syrup. The goal is NOT to wet the frame, though I am certain a bit of mist does land on the frame between the bees. The goal is to very slightly mist the bees. Then slide the frame into the nuc. Repeat three or four times, depending on how much honey/pollen is on the frames. If there is none, or very little, substitute one of those frames with a honey frame. Nurse bees wont fight, but as they clean themselves and each other they will become used to the new scent, and be even more accepting. If you are taking all of the frames from one hive, this step is not necessary. The last spot / slot will be an empty DRAWN comb. This can come from any hive and can usually be found on the outside edges of an upper box. The purpose of this frame is to immediately give the queen a place to lay. I keep the brood together so the bees can cover that brood and put this frame in directly beside one of the brood frames. If I have the population, I like to give them a good shake of nurse bees from another frame as well. You have to make the choice here. Do you move the old queen to make this a legitimate artificial swarm? (if thats what your trying to do) Or do you put one of those new queens in the nuc? Do you have a capped queen cell? If my purpose in making this nuc is an artificial swarm, I move the queen. If this is a summer nuc I will put a new queen, either purchased or a raised queen cell into the nuc. This decision should also be based on the age of your queen. If the queen in this hive was a new queen last year, I “may” leave her in the hive, trusting her pheromone is still strong. If this is her third year I will put her in the nuc. This nuc will become a brood and foundation factory for my other hives and nucs. Depending on the cages received with the new queens, they can usually be pressed into the wax JUST under the top bar between two frames and still allow you to insert all five frames. See more about installing queens on the QUEENS page. I set this nuc on it’s own stand, put a feeder jar with 1/1 syrup on top of it. I reduce the entrance. I put a screen or other block of some type over the reduced entrance. NOT to keep them from coming and going, but to stop direct line of flight into the nuc, and hopefully prevent robbing as this nuc begins to grow. Now I leave this nuc alone for about 5 days. Sometimes 4 days, sometimes as much as six days... but they should not be left much longer. The bees in this nuc will already be building that queen cage into the comb making it harder to remove. At the four to six day inspection, spread the frames, examine the queen cage to make sure she was released. Remove the cage, close the frames together, and leave this nuc alone. Come back 7 - 10 days later and look for eggs. Be prepared at this time to add another box to the top of this nuc. If all has gone well, the bees from the brood you put in will be emerging, or will have already emerged, and the new queen will be ramping up egg laying in those empty cells. This nuc will be set to expand rapidly. They will be ready to draw comb and swiftly grow into a production colony. If no eggs are seen at the 7 - 10 day mark? No queen can be found? Make a very thorough inspection, take the time you need here to insure there really are NO EGGS, and no queen present..
Re combine the nuc to a week hive using the newspaper combine method. The queen was not released! She has been in there long enough for them to get used to her. Give the nuc a light spray of 1/1 syrup mist across the top bars, and mist the queen. Pull the cork out of the NON candy side and cover the hole with your finger. With the mist of syrup she is not likely to fly away into the distance, but make SURE to hold that cage down ON the top bars, preferably between, then remove your finger and let her quietly walk out into the hive. You can also pop the screen loose from the queen cage and release her into the hive that way. Relax, be patient and calm. Stop shaking, take a deep breath and be confident, the release will go much smoother. More on this under the Spring splits tab. So lets say you have 20 colonies, and 10 nuc's.. Lets also say that over the winter you LOST 5 colonies and three nuc's. 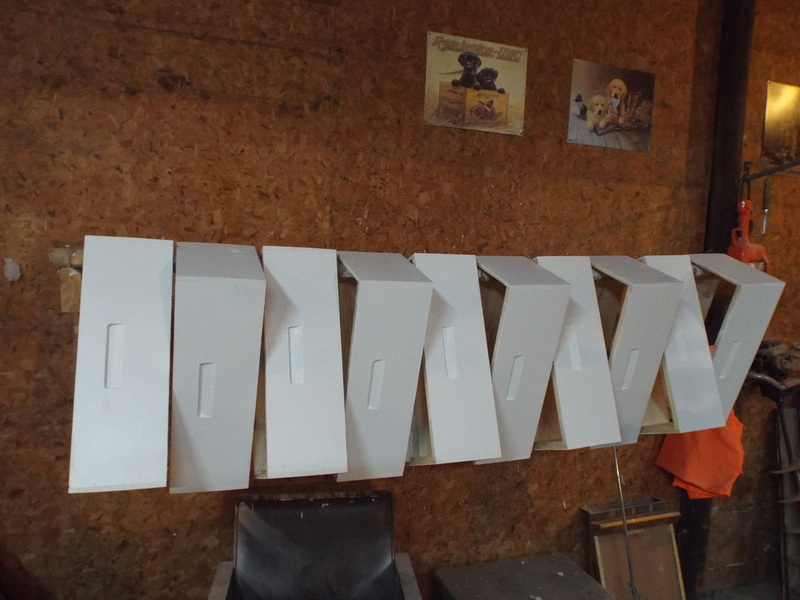 Sell the nucs as overwintered nucs for $150.00 - $200.00 each. You can keep those two nuc's, and as they build up strength, you can begin pulling a frame of brood from them once in a while to keep them from becoming crowded, and give that frame of brood to the weak hives you just created from your other nuc's. Why? To help those colonies build up faster, and possibly create surplus honey for you THIS year instead of next year. As stated above, as your nuc builds strength, frames of brood need to be removed to keep them from overcrowding, and or swarming. Depending on the time of year, these frames can be used to create NEW nuc's. The frames can be given to colonies that need the extra strength to help prepare for winter. As mentioned above, these frames can be given to young colonies you are trying to build up for production, to greatly increase their strength. In so doing, you may take a first year colony and have it producing a surplus of honey in its first year. The last resort, if you have nowhere to put the excess brood frames. Uncap them with a hot knife and put them back in the Nuc. The bees will go to work cleaning out the dead larvae. Dragging them from the cells and out the front of the hive. They will clean the cells and the queen will lay eggs in them again. Nuc's that overwinter can provide the younger queens to replace the aging queens in production hives. Nuc's can be used as brood factories. Taking excess brood from them so they do not swarm, and giving that brood to hives you are building up for production. Nuc's can be used to make more Nuc's. Nuc's can be used to produce extra comb. Nuc's allow you to draw resources from THEM to do these things, rather than using your full production colonies. In that way, those production colonies are providing honey and wax, rather than the bees to rebuild loss, or provide increase. As mentioned above, the Nuc boxes can be used to create a surplus of drawn foundation, or COMB. With each frame of brood removed to control their population, a fresh new frame can be installed to be drawn out. If they fill an outside frame with honey, IT can be pulled, and put in the freezer to use for winter stores in the event they, or another hive is not prepared when winter arrives, and another comb installed to be drawn out. If I had 200 fresh drawn combs come April, I would still need more. The greatest advantage of having a nuc make new comb is that they will almost always build worker comb. Drawn comb is one of the most valuable things a beekeeper has. Come March, when warm weather begins to arrive and the bees become active, they will RAPIDLY begin to use up stores. Left over stored honey can be given to them to get them through until natural pollen and nectar begin to come in. 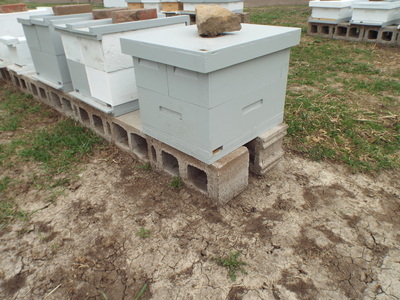 Fixing a queenless situation, or replacing an aging queen is very simple to do with a nuc. Simply remove an old or failing queen, and combine the entire Nuc to that hive the following morning using the newspaper method. You can make an adapter using a piece of plywood that covers the top of the main hive, with a hole cut in it that the nuc will fit on top of. Place the newspaper over the hive, poke a few small holes, or make a couple of slits in the paper and place the adapter on the paper. Remove the Nuc from the bottom board and set it on the adapter. The bees will begin to chew away the paper as the scent of the two hives mingles, and by the time they have it removed, the queen-less bees should be very happy to have "FOUND" a queen to sustain their hive. Do this in the evening when it is cooler to avoid overheating the bees in the Nuc. If it is warm out, put the NUC bottom board on TOP of the Nuc box and reduce the entrance as if it were on the bottom. Face the entrance to the rear, or opposite the entrance on the queen-less hive. This will allow the bees to get OUT of the nuc if it gets too hot, and it allows some ventilation to keep it from overheating. Give them a few days, and then inspect for eggs in the main hive. The queen should have moved down along with the bees from the Nuc. At this point, you can remove the paper, shake the bees from the nuc into the hive and put a queen excluder under the adapter. Replace the nuc and wait for any capped cells to emerge. When no more capped cells remain, you can shake the frames out into the hive and remove the Nuc. It is fully drawn and ready for refilling/splitting when your hives are strong again! If the queen did not move down, you can swap the frame she is on with one from the main hive, and then proceed as above. The same method can be used when you realize a queen has died, been injured, or is just MIA for unknown reasons. Make SURE she is really gone before doing this! Maintaining Nuc's should be on everyone's to do list if you have more than a couple of hives. If you find that you are growing beyond your boundaries, abilities or comfort zone, those extra Nuc's can be sold. Overwintered Nuc's are always in demand because they will usually build up fast enough when hived during early spring to produce surplus honey THAT year! What is the best way to make up my nuc's for overwintering? Come late June, you will normally notice that you have a hive that just didn't produce. I am not talking about a hive that is sick, has Nosema, Chalk brood, EFB, or AFB etc.. Good healthy bees, that just did not build up, or built up too late to produce. THIS hive is the one you can use to make nuc's with. Go through the hive, see how many frames of brood you have. Figure two frames of brood per nuc. Produce new queens from your favorite queen in a strong nuc. When the cells are ready, split this hive into nuc's and give them each a queen cell, leaving one of the queen cells in the strong nuc. You have not lost production, but you now have the means to take a few more nuc's into winter. Summer nuc's populated and beginning build up in preparation for winter. I will manage these nucs the rest of the summer and fall, then overwinter them. I am trying three different styles this year, as seen in the pictures above and to the left. There are also different queens. Michael Palmer style nucs, 5 frame standard nuc's, and 5 frame double nucs. Golden queens, Black queens, and tiger striped queens from feral colonies. Gold and black queens? You mean Italian and Carniolan queens? Nope, I mean gold and black.. I doubt very much the "pure" genetics of any of them. They were also mated from this yard, which means they are likely to have mostly feral drones to mate with. These are American queens! Just different in color, kind of like the people that live in this country! My personal preferance has quickly become the standard, NORMAL 5 frame nuc. the double nucs on the modified bottom boards worked well, and the Michael Palmer style nucs also worked, but I prefer the extra frames in the 5 frame nuc, and the versatility of having them on their own bottom board. They can still be slid together to winter side by side, but have a full ten frames, and can be removed one at a time as needed when a queen is sold or they need to be upgraded to a full sized box. Let me ask you a question. Answer it to yourself. Did your packages die last winter? Some of them? All of them? Did you order more packages to replace them this spring? OK, do you expect better results in the coming winter? I see new beekeepers, I talk to them, I answer their questions, I try to help them. What they are doing is not wrong. They read, they ask questions, and they work pretty hard at keeping bees using proven methods, but their bees died. They blame themselves, without understanding what it was they did wrong. In a majority of the cases, they didn't DO anything wrong. I ordered ten packages last spring to give them the old college try.. 8 of the ten packages superseded their queens within two months. EIGHT of those hives perished during the winter. ALL of my locally bred queens survived the winter. Still think any bee can survive any climate? The first four packages of bees I ordered were texas bees. They were bragged about, so I thought I had some pretty good bees. Three of those packages died the first winter. The fourth package died in the next winter. They had plenty of honey, they died two inches from it, because they could not break cluster to get to it. I have tried this three times now, and the results are always the same. Of those ten packages, 8 died, as stated above, inches from food. The remaining two struggled through with small clusters, and will be requeened if they make it to the flow. My feral colonies from swarm traps and cut outs ALL survived. My local Carniolan mutts ALL survived..
"California, Texas, Hawaii bees are shipped to CANADA and do fine.. YOU are doing something wrong..."
When all my other bees survived? I don't think so. Perhaps, I need to PAMPER those bees? Make Styrofoam boxes to insulate them? Put heaters under the hives? Umm, no.. I don't think so... The fact is, those folks may be correct. I may NOT be wintering these bees correctly. But it is also a fact, that MY bees survive using a proven method of overwintering that is used successfully from Missouri to Nova Scotia. If I have to do MORE than that to get them to survive, then I do not want those bees. YES, I expect to lose hives. EVERYONE who lives in the northern climate is going to lose a few hives. But you should NOT lose them all, most, or even half. I plan on 20% loss. I average a loss between 5 and 10%. I plan for the worst.. In speaking with other beekeepers, going to meetings at three different clubs... There was an 80% loss for the winter of 2013/2014!!!! The winter of 2014/2015 was not nearly as bad, and there was still a 60% loss.. It is my belief that a large part of this is crappy genetics! BUY package bees, let them get established! Then buy a local or northern queen in June and replace that package queen.. EVEN if the package queen has been superseded. I do not believe the package producers are selecting for winter survival.. I do not believe they are selecting for mite or disease resistance.. Or even honey production.. Gentleness? I believe, they are selecting for GROWTH so that they can produce packages! There are exceptions I have no doubt. But I don't like to spend money on a gamble. Give me a queen that has overwintered in a climate like mine, or worse, and I will have confidence. Raise your OWN queens from the survivors, Put them in nucs to overwinter, and you WILL have bees that are better suited to YOUR area. Proven bees! In the famous words of Forest Gump... Thats all I have to say about that. So many things to think about and learn. For me, that is part of the joy of beekeeping. There will always be something to learn. New methods to try, and better ideas that you can modify to help make managing your bees easier. As time passes, I will be adding pictures and information to help make what I do more understandable, so check back often!